Born in 1980 on the island of Ischia, Andrea Migliaccio is the brilliant Executive Chef of the two starred Michelin restaurant l’Olivo in Capri. At L’Olivo, Andrea takes over from Oliver Glowing for whom Andrea was sous-chef confirming and strengthening the prestige of the only 2 star Michelin destination on the island. 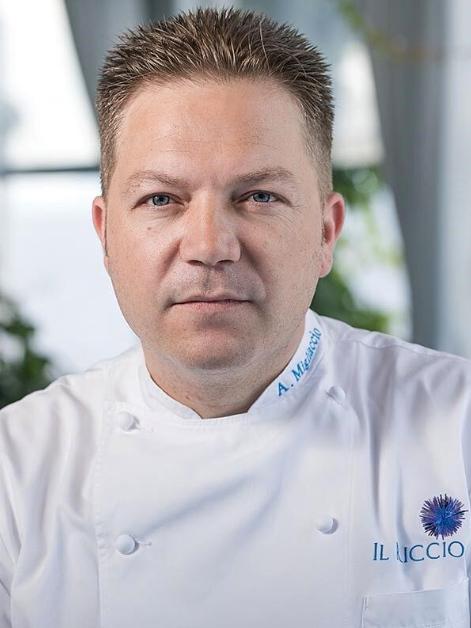 Andrea led the kitchen brigade at Il Riccio Restaurant & Beach Club, just steps from the Blue Grotto, since its opening in 2009, contributing to the achievement of its first Michelin star in 2013 before passing the leadership of Il Riccio to Chef Salvatore Elefante. Since 2010, Andrea is also Executive Chef abroad, in Zermatt, at the Capri Restaurant where also this year he has confirmed the Michelin star. Additionally, from 2013 to 2015 Andrea was the Executive Chef of Larte in Milan, in collaboration with the Altagamma Foundation. Since 2016, Andrea covers the role of Executive Chef of the restaurants L’Olivo, Il Riccio and the Assaje. Following the internationalization of the brand of Il Riccio, Migliaccio also supervises the Il Riccio restaurant in Bodrum. Migliaccio sees this new step of his career as a further step into his development. “ I am always looking for great food and transmitting my values to my team”: being Chef for Andrea is an act of devotion, a job made of professionality, humility but also success. “ I learn a lot from my team, I give and receive from my staff”. Andrea’s cuisine is inspired by simple principles, innovation and tradition, classical traditional dishes, which respect seasonality, and selecting the best the Mediterranean has to offer. Andrea Migliaccio and his team’s art consists in reinterpreting in a modern key the typical local gastronomy for a service which points to excellence. It's hard to single out one specific thing. What I fear in this industry is that the human value and talent are put aside by other modern technologies. It's the people who make the difference in this business. Homemade lemon tagliolini pasta with burrata cheese, red raw prawns, sea weed asparagus and oyster leaf. I play hide and seek with Davide and Luca, my two little children. I'm proud to work with young and talented individuals who share my same passion for this job. On a personal level, my family gives me reason to be proud every single day. Yes. I would like to get a third Michel Star for L'Olivo restaurant. I don't have time for envy. My job is so intense that all of my energies are dedicated to it. If I'm over indulging it's going to be with excellent food and fine wine. Italy has a such rich gastronomic offer that it is impossible to resist.